I drew this picture for my 16-year-old cousin Laura in January/early February ’98, and gave it to her soon after I finished. 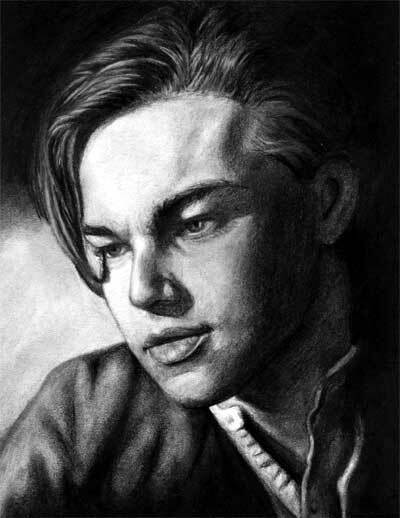 She had begged me to draw Leo for her for a long time and in the midst of all the hype with Titanic and her persistence, I caved in. Being that I drew this in high school, often working on it in school, an overwhelming amount of people wanted copies. So, I scanned it onto the computer, printed it out, & handed out over 30 copies. This drawing inspired the art gallery section of Jesusfreakhideout.com which later became this site. Anyway, I used white & black charcoal pencils and a stick of condensed charcoal for the large black areas. It’s actually one of the very few drawings I’ve done in charcoal that I’ve liked enough to even post here. I did quite a few in high school for classes (and maybe a few in college? ), but I can say, as of 2010, that I probably haven’t worked with the medium in a good 10 years at least.